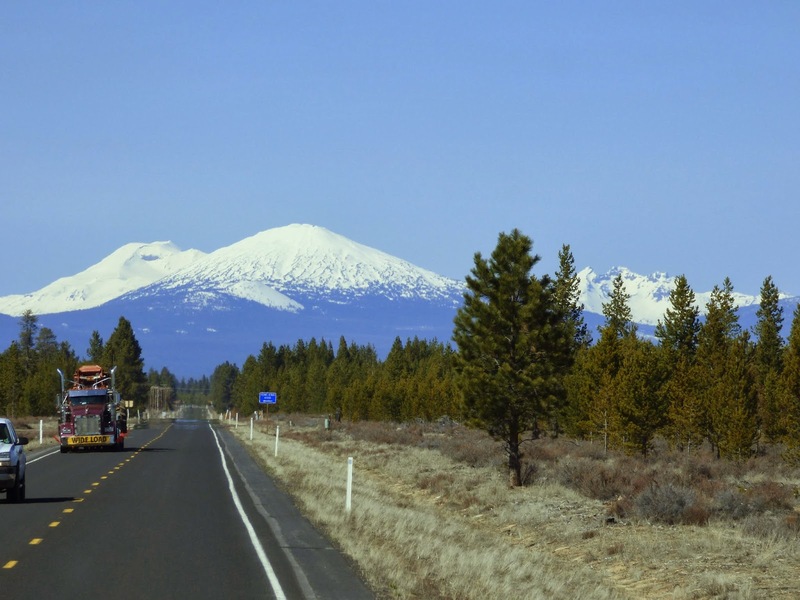 We arrived back in Oregon today for the next month until the 29th April. Glad we decided to come in week early due to rainy weather and possible snow. 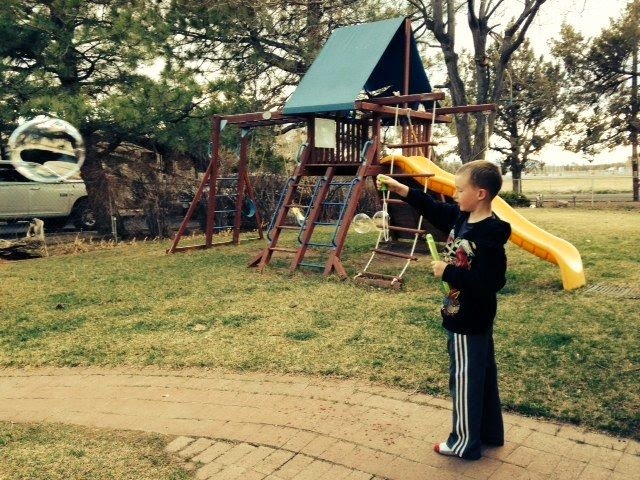 The grandsons are on spring break, busy with softball practice and visiting friends. Shawn is coaching the team this year and both boys are on the same team. It is good to be back. Today was errand day and Cade wanted to see the Muppets Movie and have lunch at McDonald's. 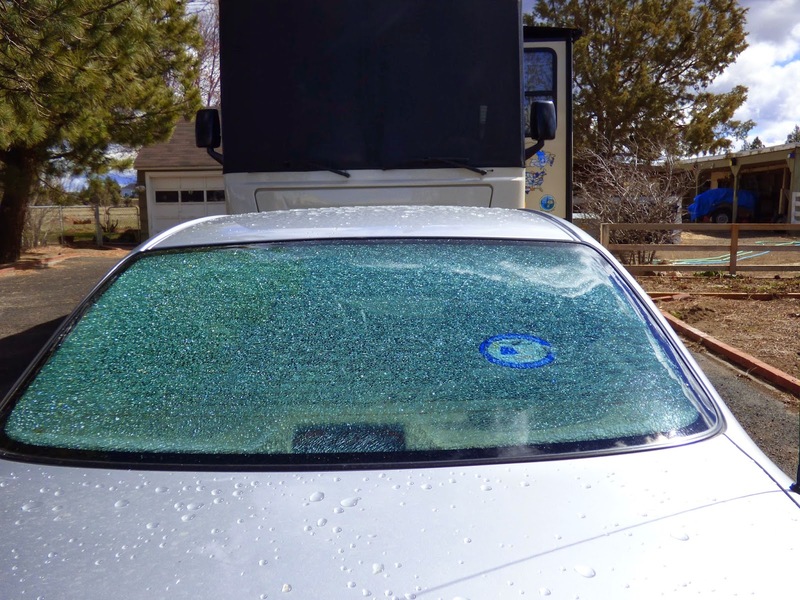 When we went out to car,discovered that the back windshield was completely shattered. So John called our insurance and it is not covered as we have $500 deductible, but they referred us to Safelite who will be here in the morning. Fortunately, Hope's old Explorer is still here so we used that. Cade enjoyed lunch and movie. This was first movie I have been to in several years. Colt is in 4H and getting two pigs for his project. They will add to the two horses, rabbit,hens & rooster.dog and cat. Never a dull moment here. I give the horses and rabbit carrots and the chickens get leftovers as well as hen food. Nice to have fresh eggs again. It is nice that we can park in the driveway and have 30amp and water. 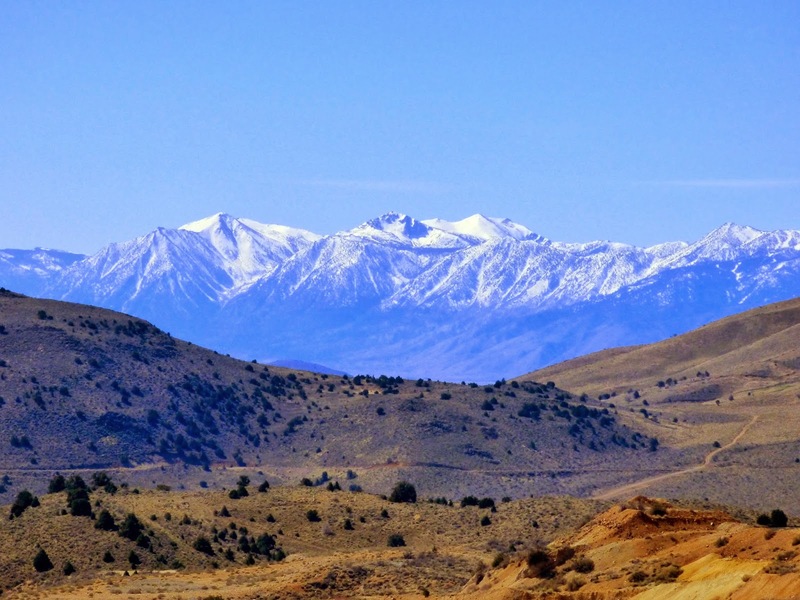 Also a nice view of the Sisters Mtns. When necessary, we go to the sewer dump by the fairgrounds. Since our dinette seat cushions are in need of re-upholstering, we took to a local place. Realize we cannot match fabric, but decided on a close coordination. Need to get things done while we are here. A very expensive fix. Also need to find someone who does leather restoration. May wait on this til next time. 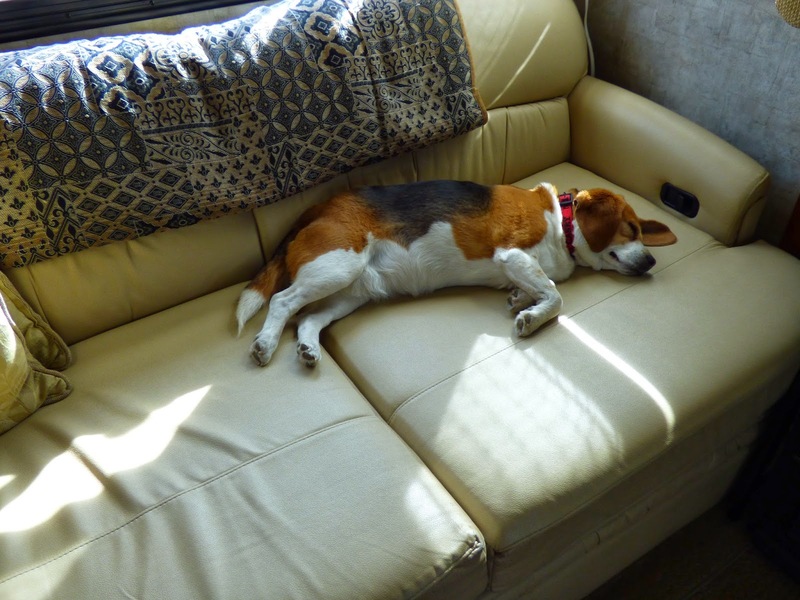 Casey has once again made this her second home during the day when the family is gone. She can't stay in the house as she opens cupboards and gets food. If left outside, she finds her way to our doorstep. 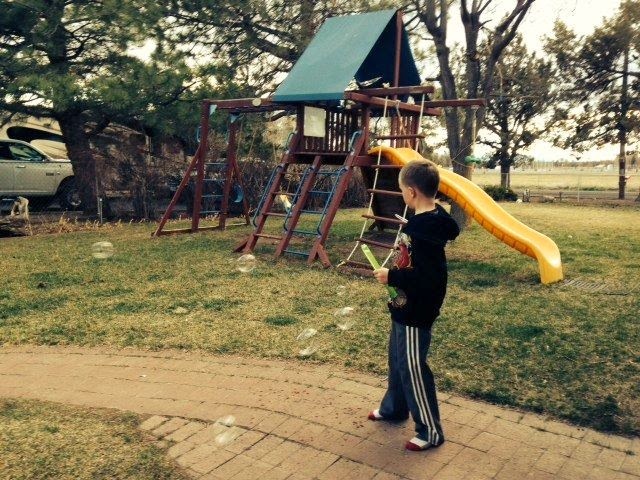 Cade blew me some bubbles with his new bubble device. Putting the final touches on our continuing trip to Canada. Have most confirmations, but still need 3 or 4. Guess the RV parks are closed for the season and don't respond to email. I was also able to find a doctor here that accepts Medicare and Tricare for new patients. Have an appointment on the 8th. Today was a new experience. 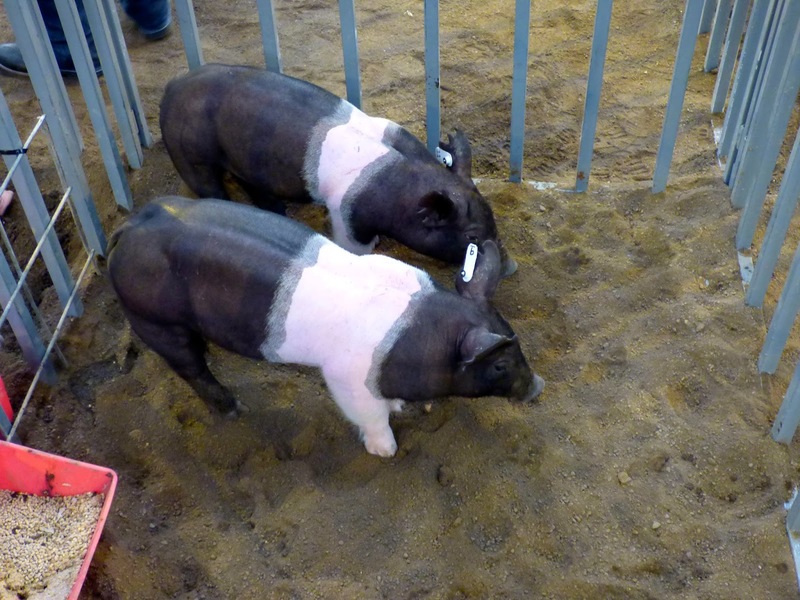 We went to the pig auction in hopes of getting a pig for Colt's 4H project. 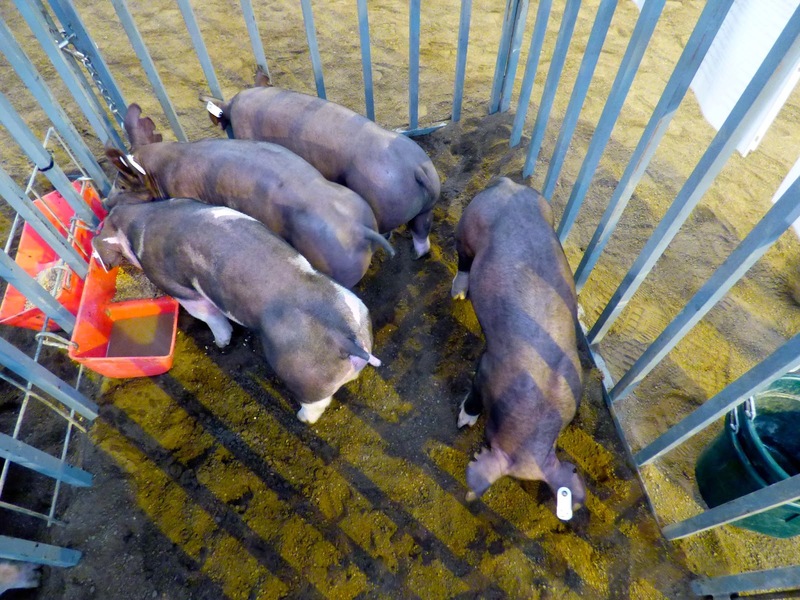 Lots of cute pigs, but came home empty handed. The bidding process is interesting. 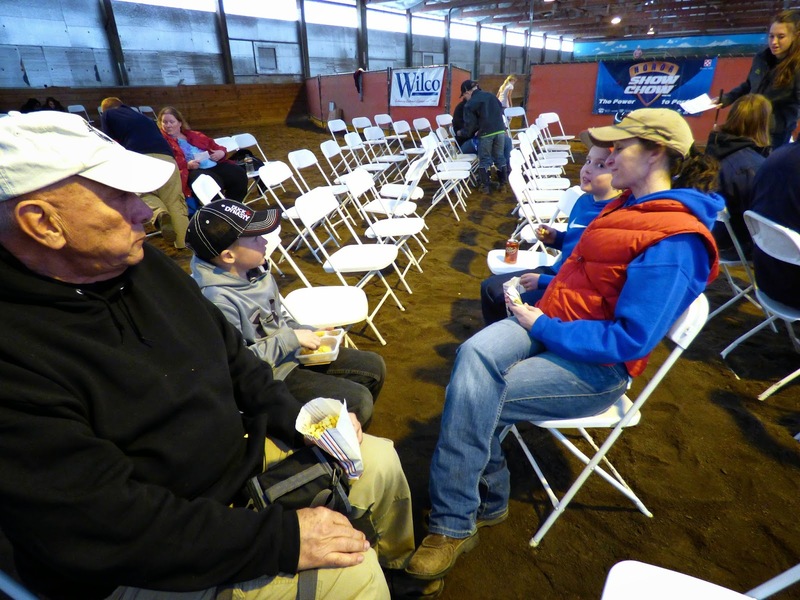 Top 2 bidders get choice of pigs. High bids while we were there were $500 per pig. Bid starts out at $200. 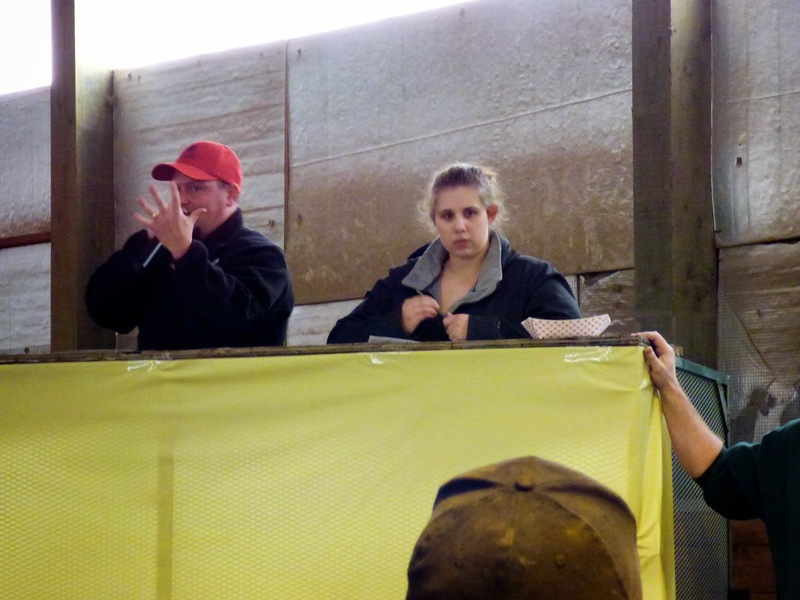 This was our first livestock auction. Grandsons go back to school this week. Weather is still cold and windy. 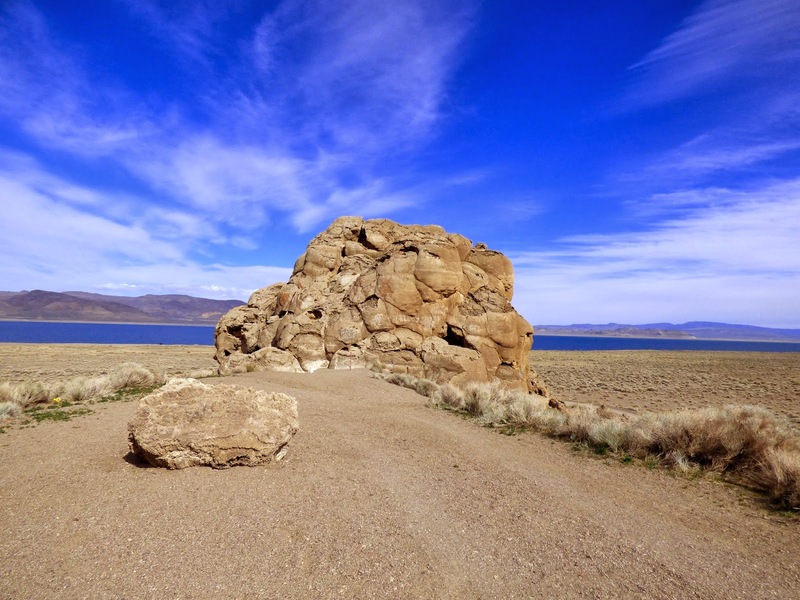 Today we drove to Pyramid Lake off IH 80 toward Reno for the purpose of trying to locate site for Fort Haven. 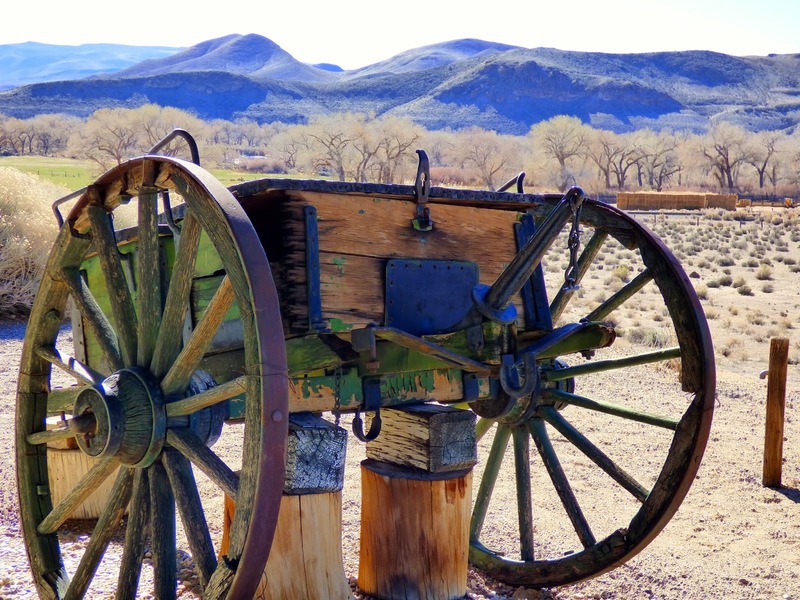 There were no markers or remains;however, the ranger was able to give us exact location. 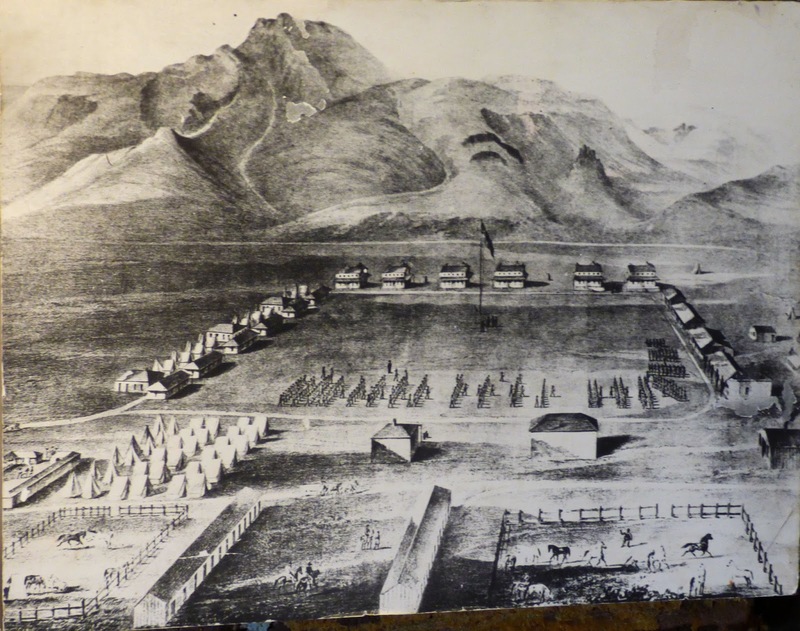 The fort was short in occupation time and from here the military moved to Fort Churchill. 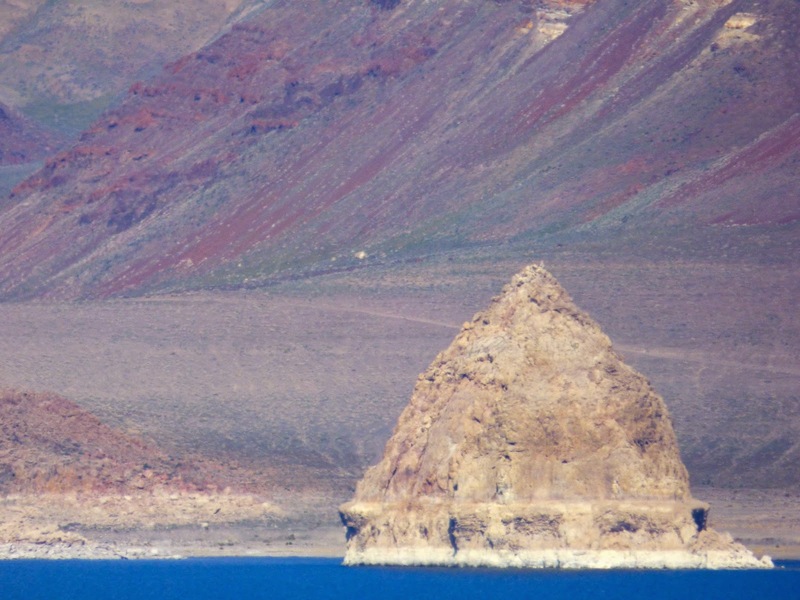 Pyramid Lake is a hidden jewel located near the town of Fernley and is managed by the Paiute Tribe. 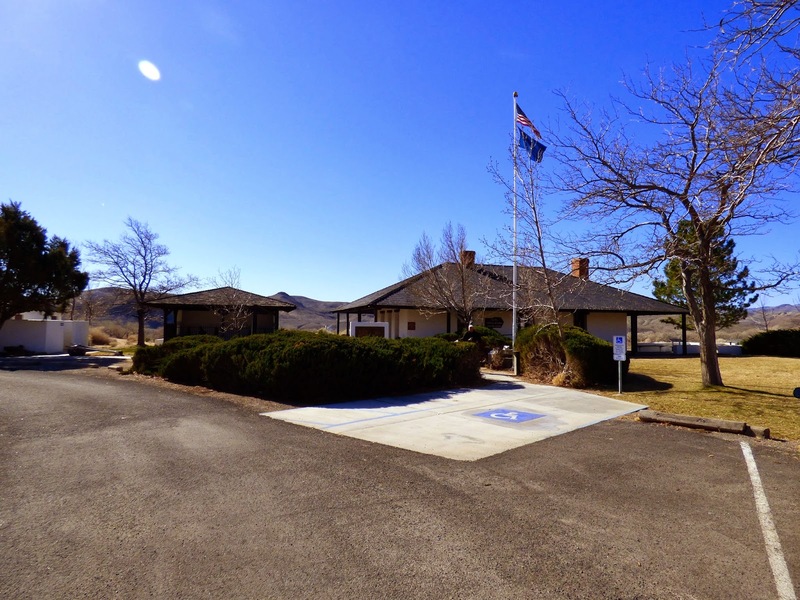 A one day pass for $7 is required and can be obtained from the Ranger Station. 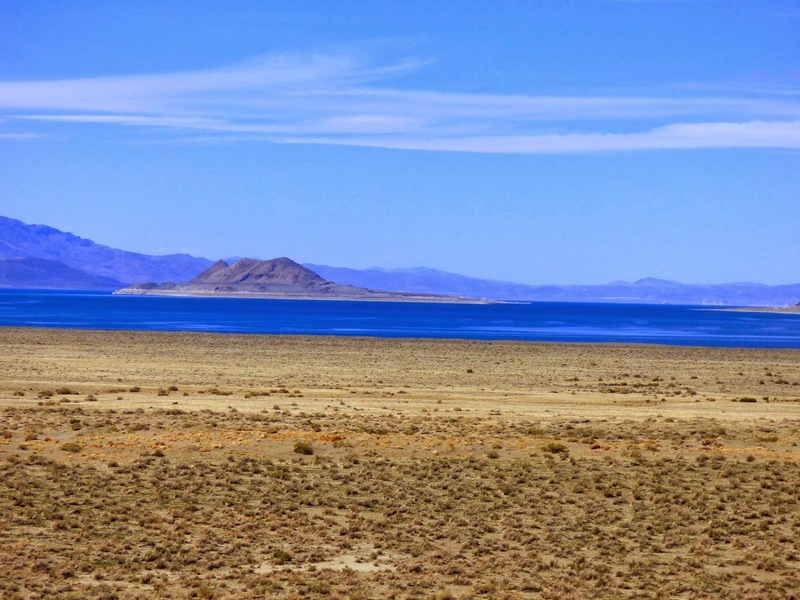 It is known as being North America's most beautiful desert lake and home to many year round recreational activities. 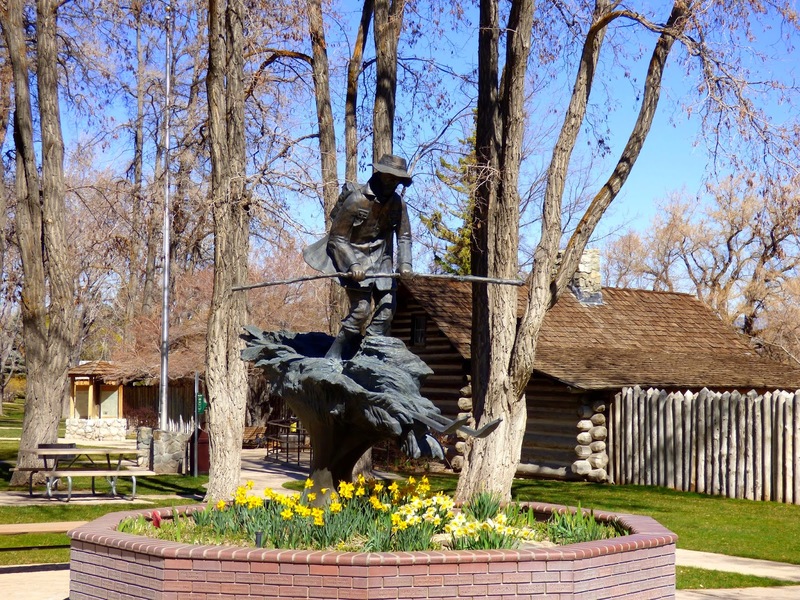 It has been designated as the first National Scenic Byway entirely on an Indian Reservation. 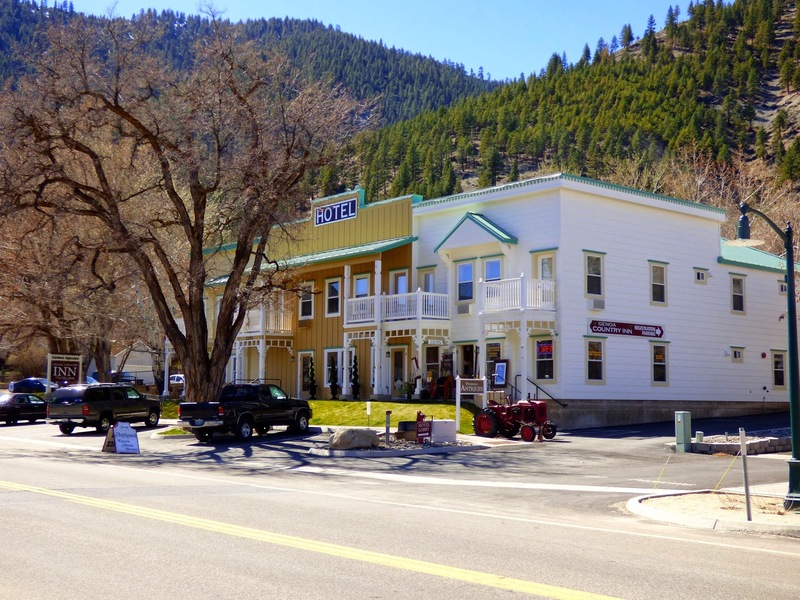 It has a shoreline of 125 miles and is fed by the Truckee River. 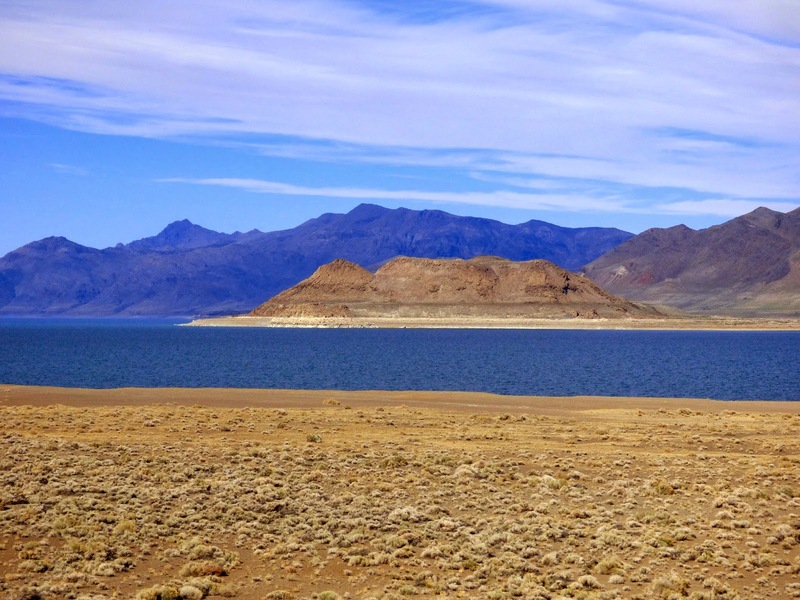 The lake is known for its Lohanton Cutthroat Trout and Cui-ui. The Cui-ui can only be found in this lake. Also one of the largest breed colonies of White Pelicans reside here. 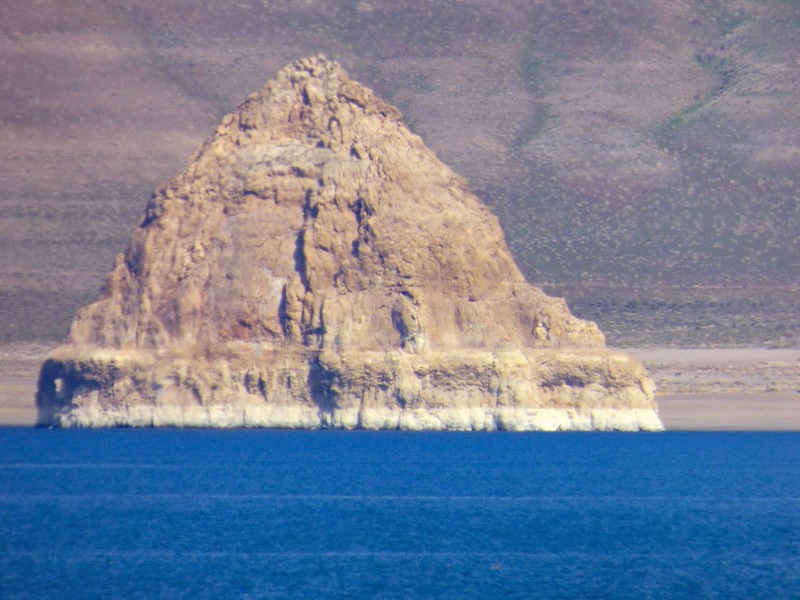 There is a small island in the lake as well as a rock in the shape of a pyramid..ergo the name. 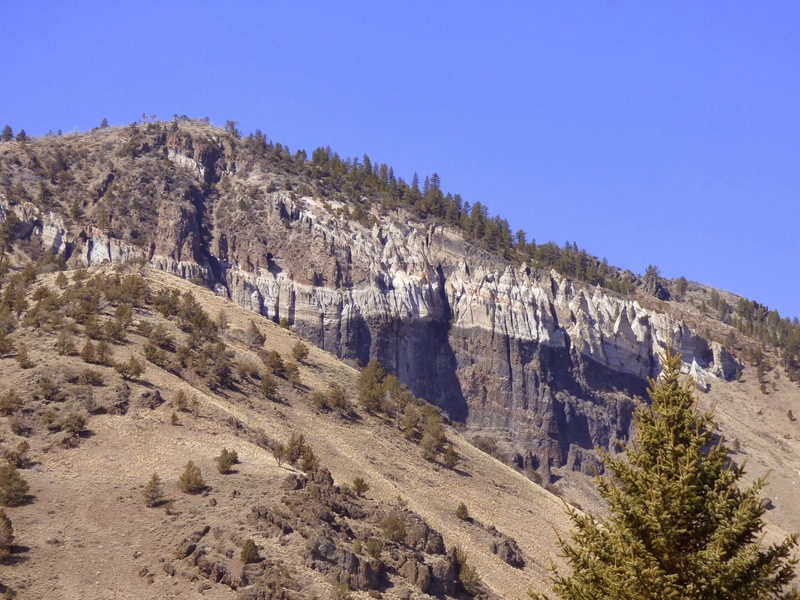 There are Tufa rock formations mostly on the east side of the lake. 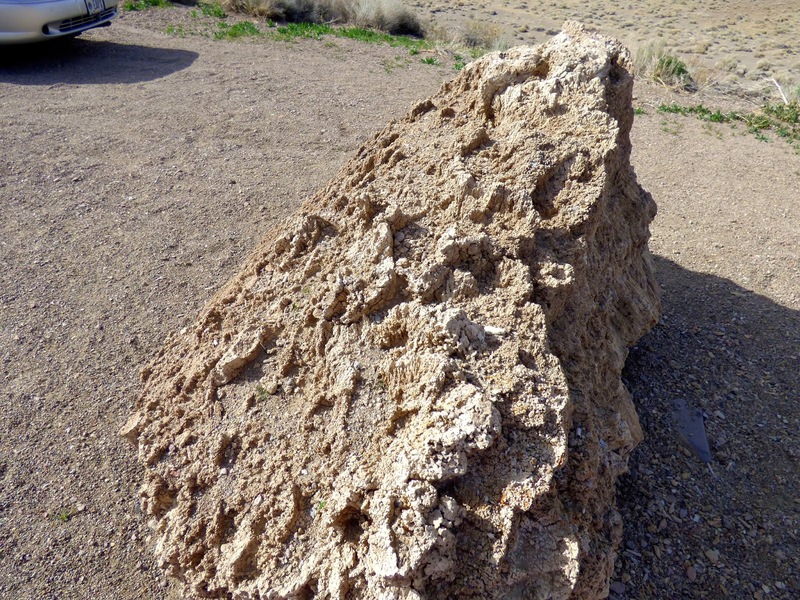 The pyramid rock is an example of this. 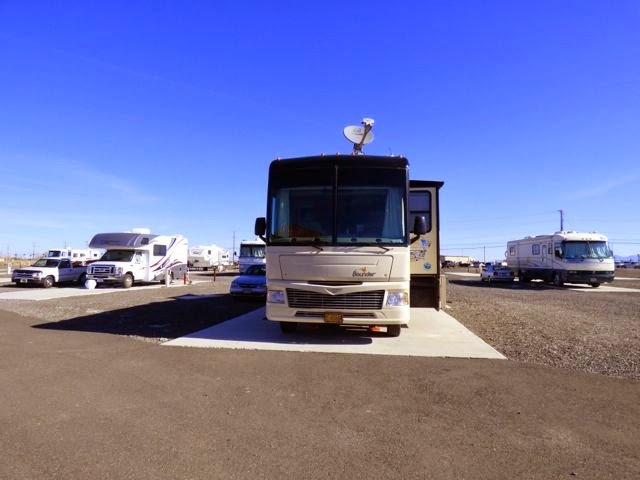 Due to impending weather in Oregon next week, we have decided to depart Fallon NAS two days early and spending only 1 night in Susanville RV park and driving to Hope's on Sunday..arriving a week early. 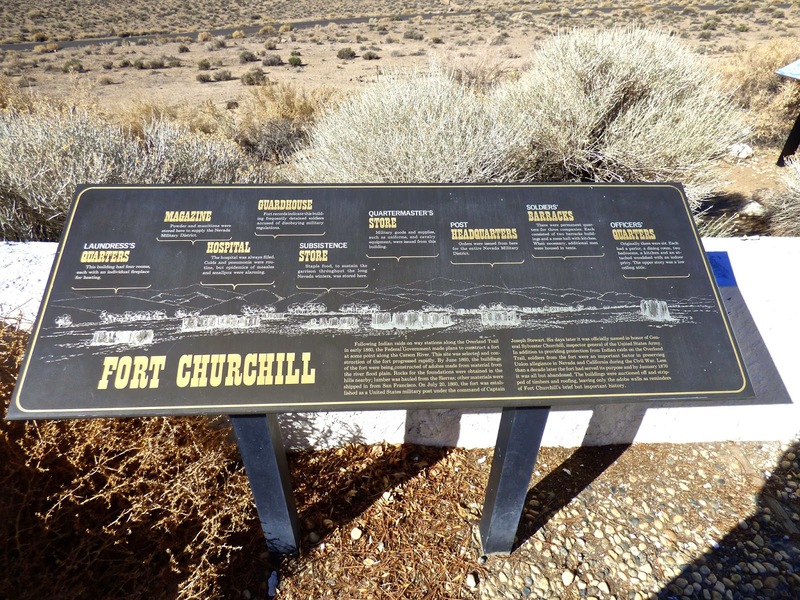 Our drive today took us down 50 with a stop at Fort Churchill on 95A just south of Silver Springs enroute to Carson City. 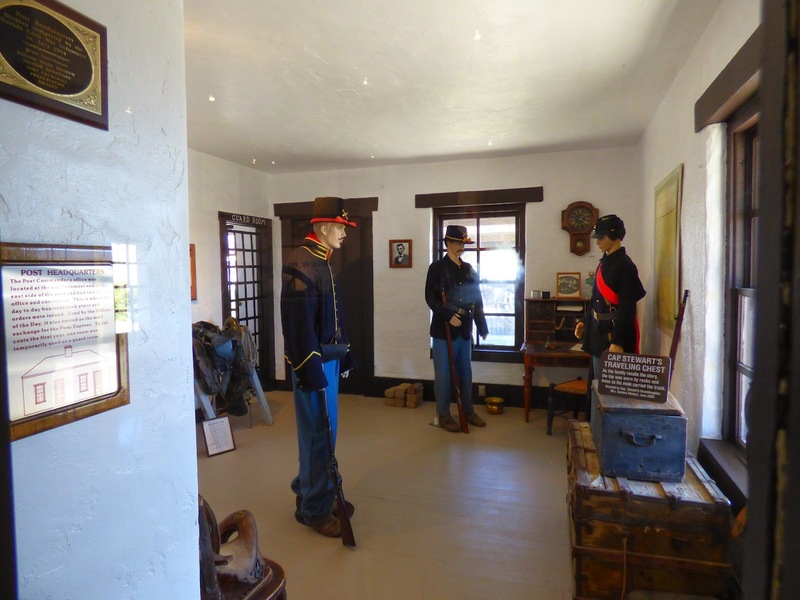 After paying our $7 entry fee, we stopped at the Visitor Center to view the exhibits detailing the history of the Fort. There is also dry camping in the park featuring a fire ring and table. An RV dump is nearby. 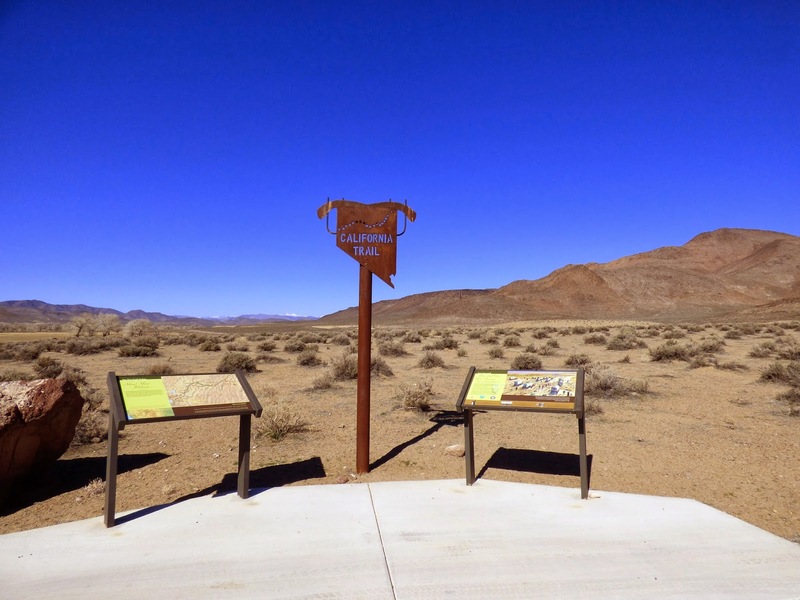 Not a place I would camp due to rattlesnakes. 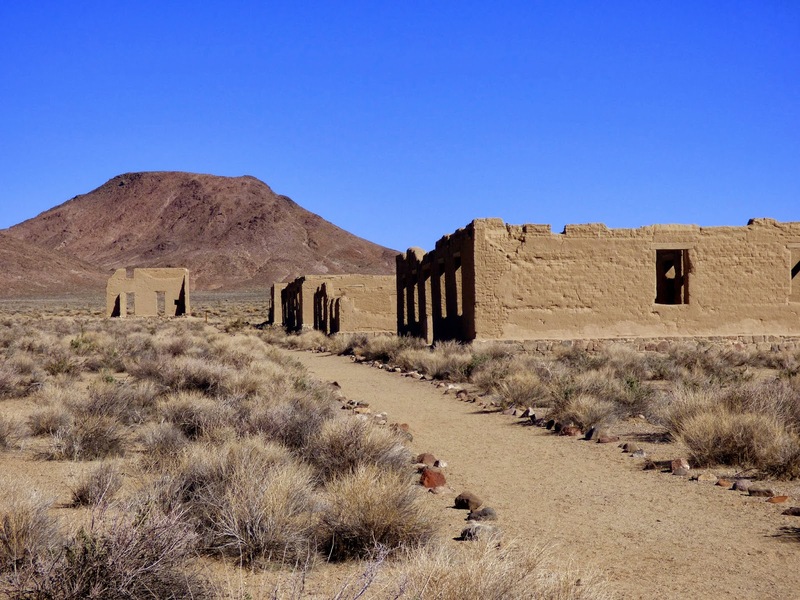 In fact, had it not been very cool today, would not have walked the paths around the fort. 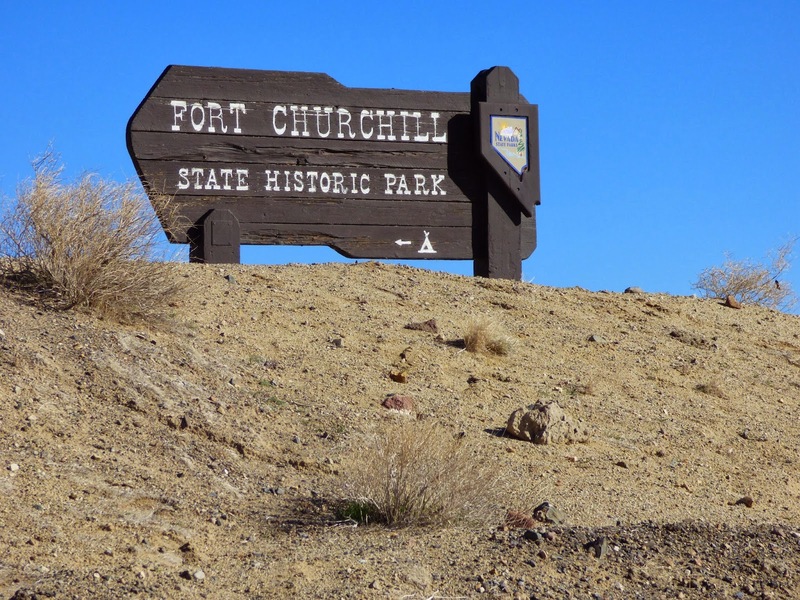 Fort Churchill was established in 1860 on the Carson River at a cost of $180,000 to guard the Pony Express run and other mail routes. 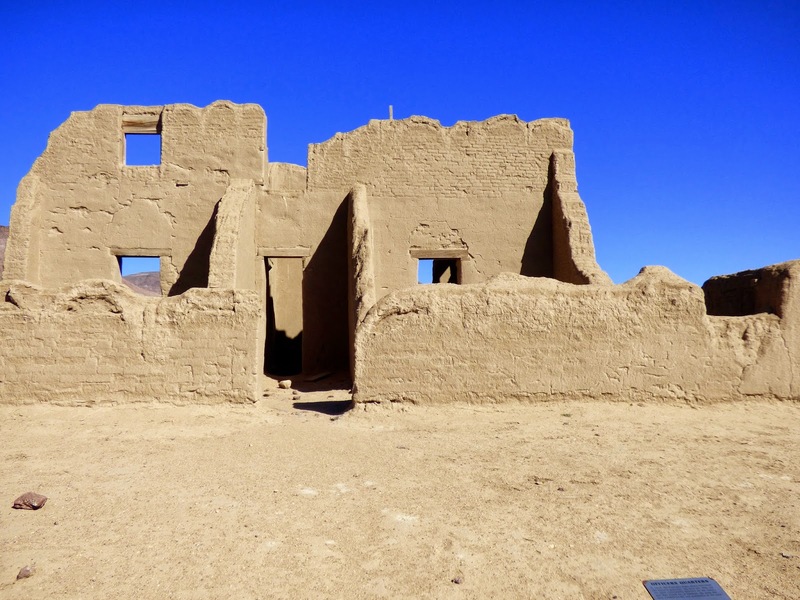 Adobe buildings were constructed in the form of a square facing the parade grounds. 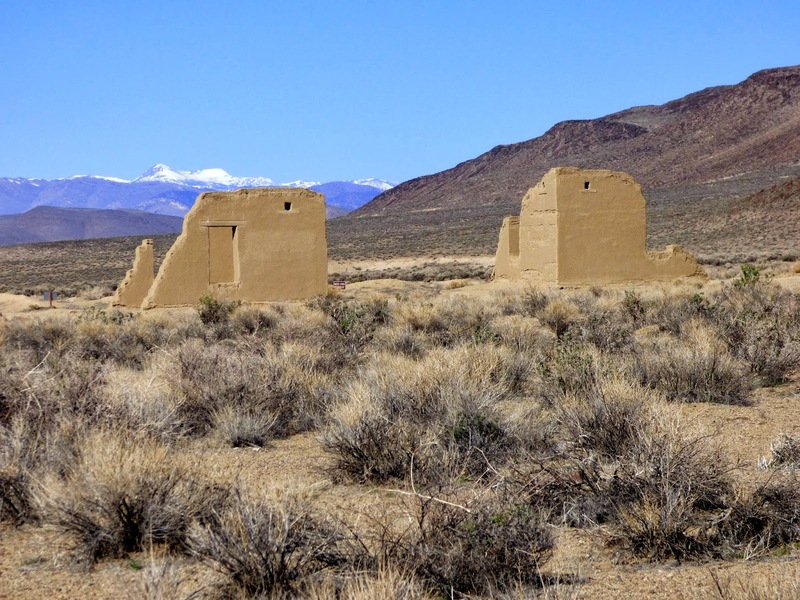 During the Civil War, the fort became an important supply depot for the Nevada Military District. 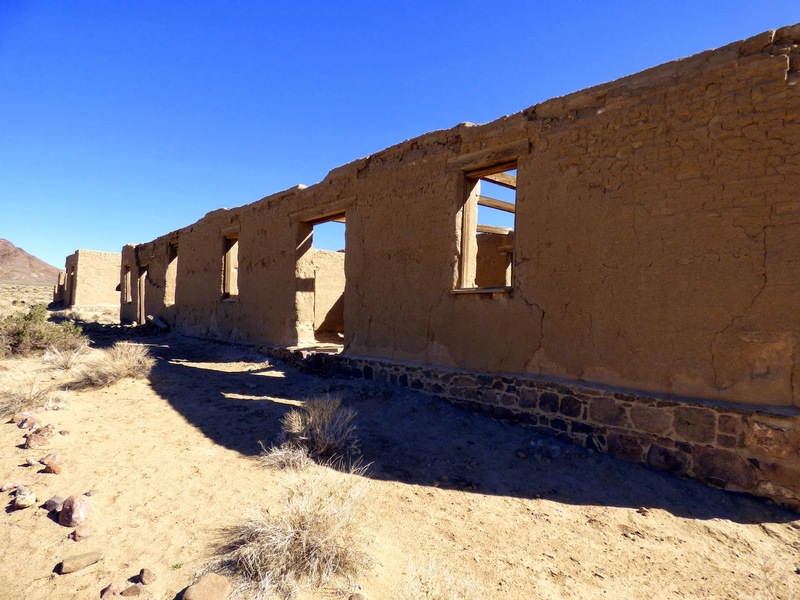 The fort was abandoned in 1869 and buildings auctioned for $750. 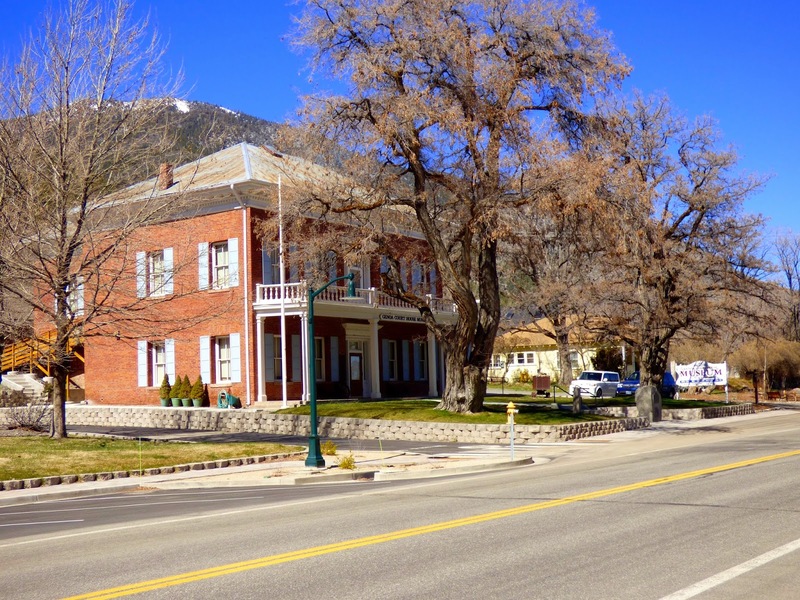 In 1884 the remains of soldiers buried in the post cemetery were moved to Carson City. 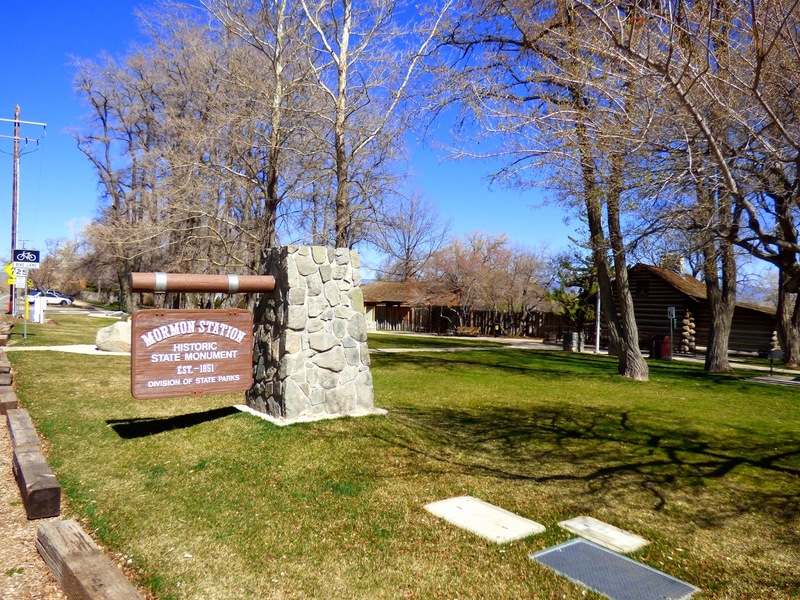 The Buckland family who were pioneer ranchers are still buried here. 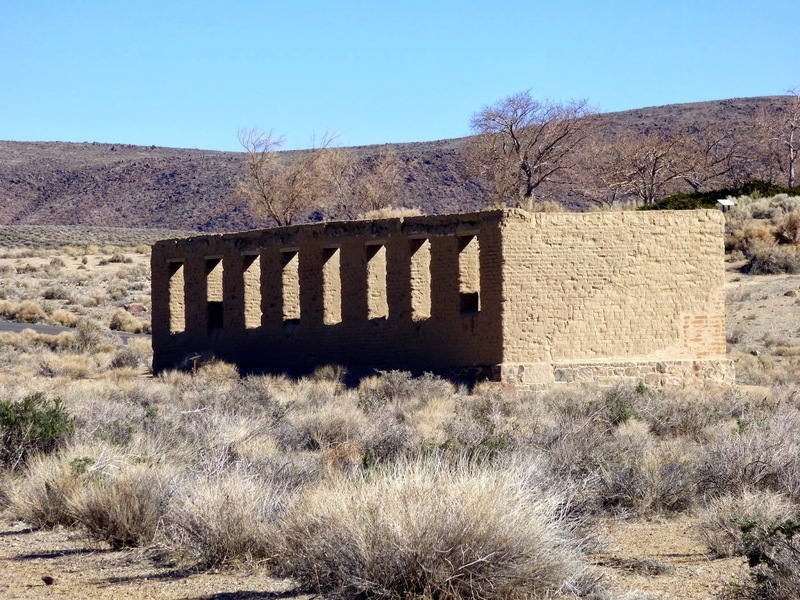 In 1957 the state finally gained control and the CCC renovated what was left after years of deterioration. 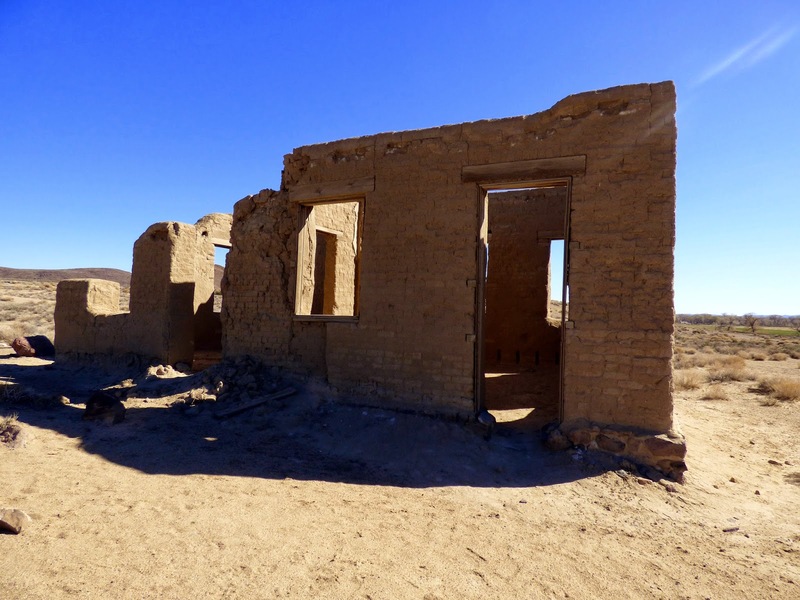 After touring the fort we drove back to Hwy 50 west with stops to try and locate sites for Forts Hays,Stone,Homestead and Nye. Progress has obliterated any signage except for Nye which is surrounded by new homes. 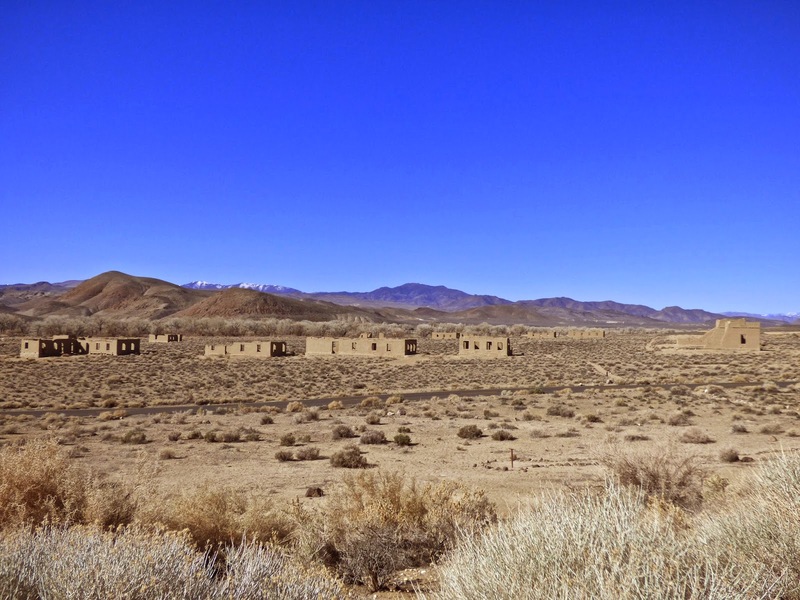 Fort Homestead was located in Gold Hill near Virginia City. 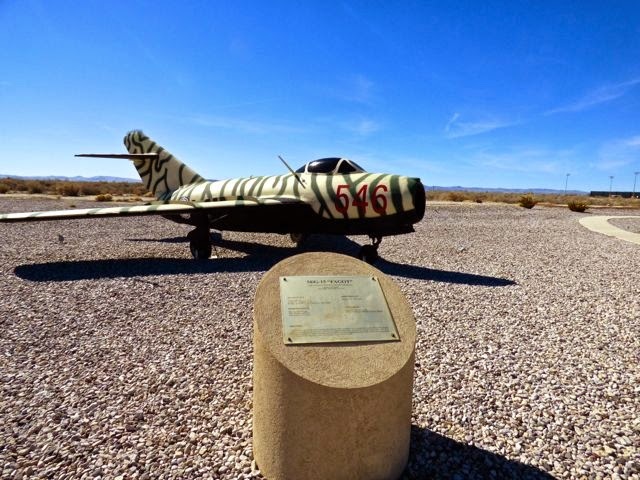 John thought he found the location, but with no clear marker and on private property we couldn't be sure. 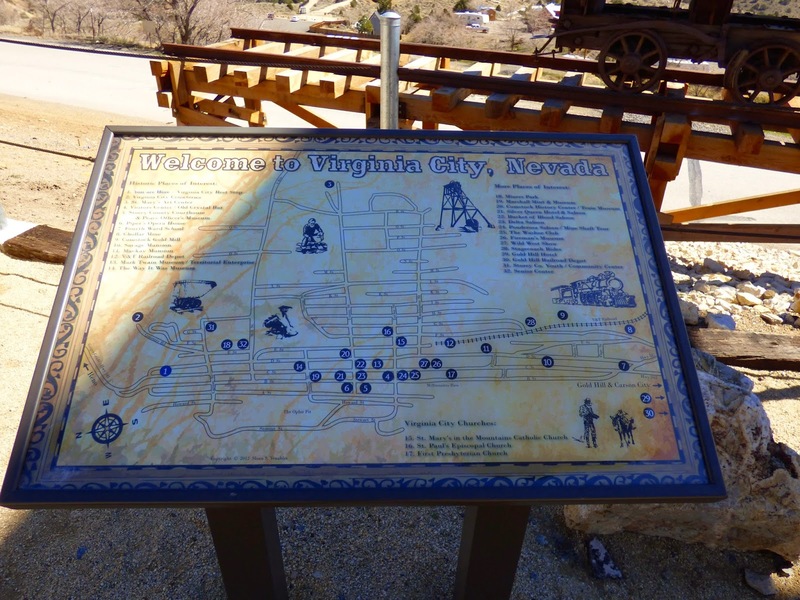 We did a brief drive through Virginia City, with the intent of returning when we drive to Reno. 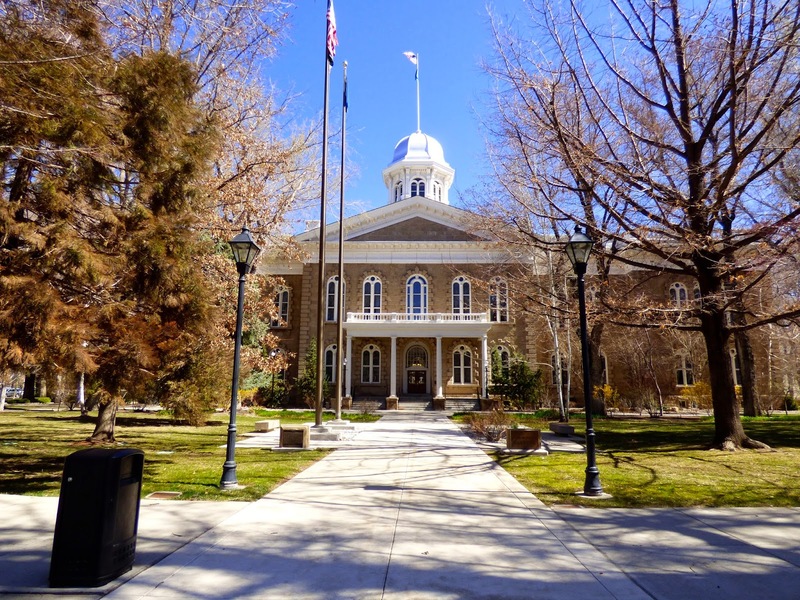 We stopped in Carson City to take photo of the capitol and then drove 395 south to Genoa to visit Fort Genoa and now Mormon Station State Park. 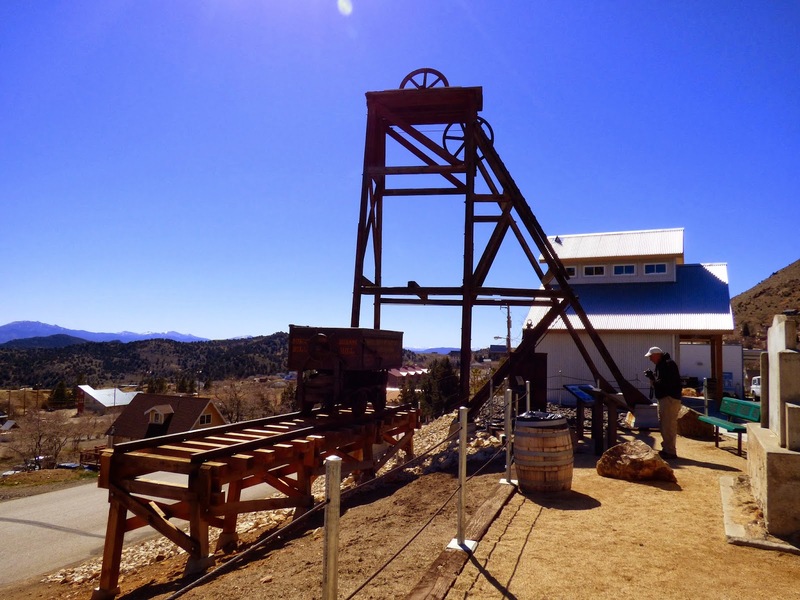 It is not open until May to our disappointment, but well worth the short drive. 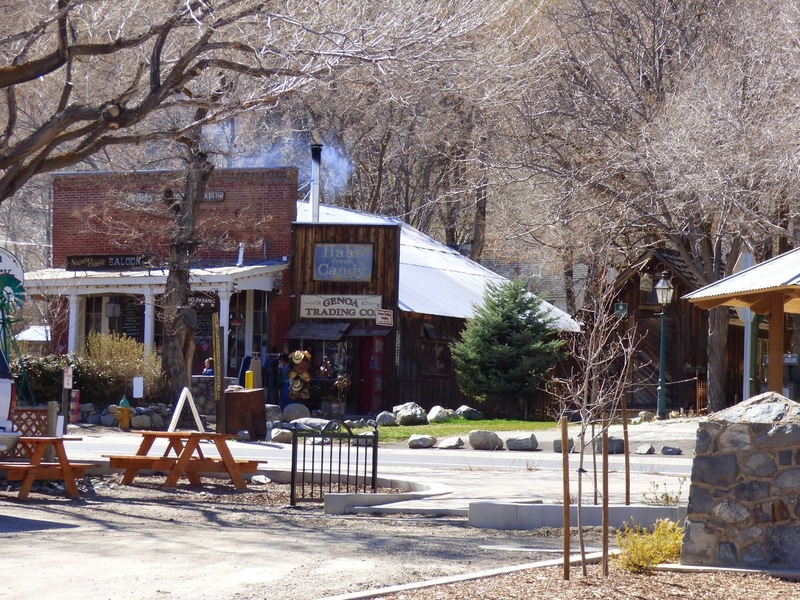 Genoa was founded in 1851 and the first settlement in the Nevada Territory. 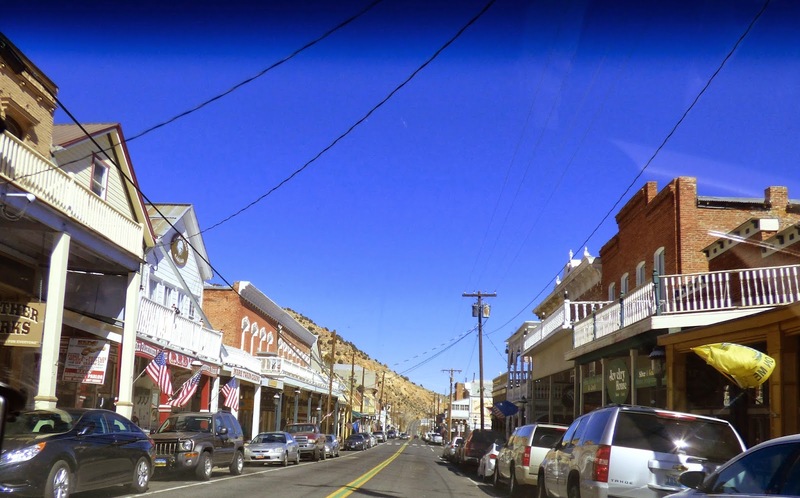 A charming town nestled at the base of the eastern slope of the Sierra Nevada Range. 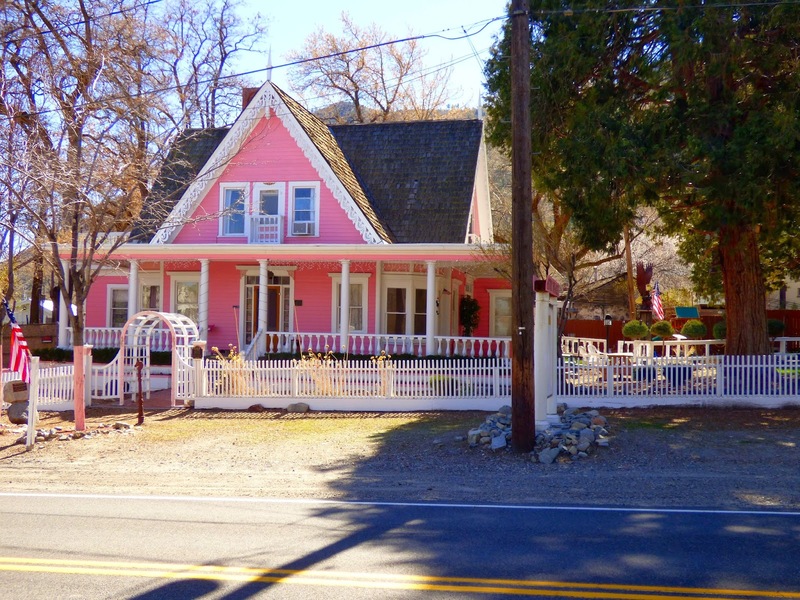 would recommend this as a stop and visit if in the Reno or Carson City area. There are shops and local eateries to experience. 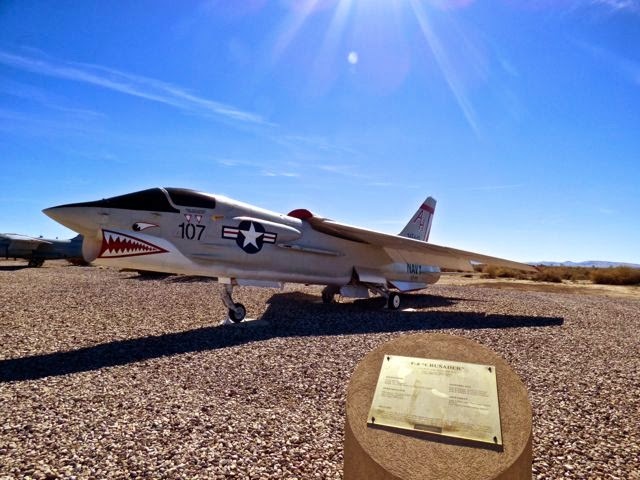 Tomorrow we are just going to relax, visit the base museum and catch up on website and blog. 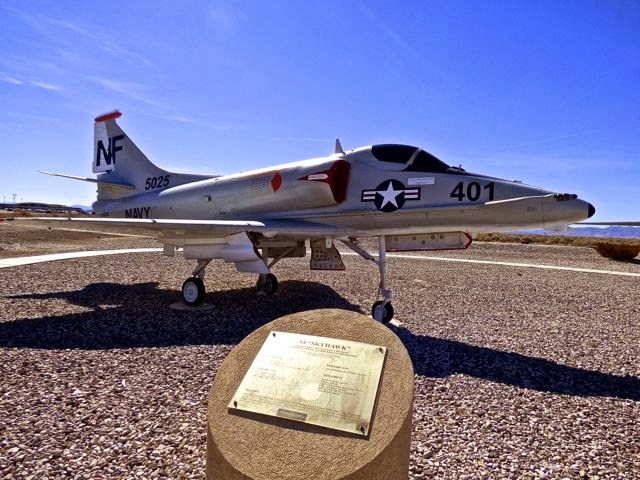 We arrived at our next stop at Fallon NAS in Fallon,NV for 7 nights. 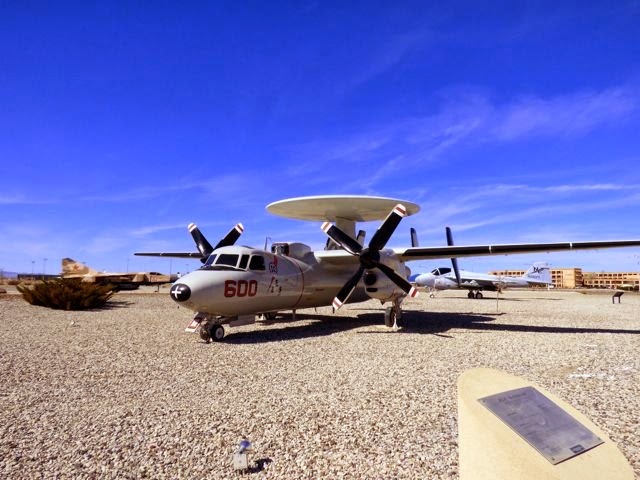 Fallon NAS is the Navy's premiere air-to-air and air-to-ground training facility. 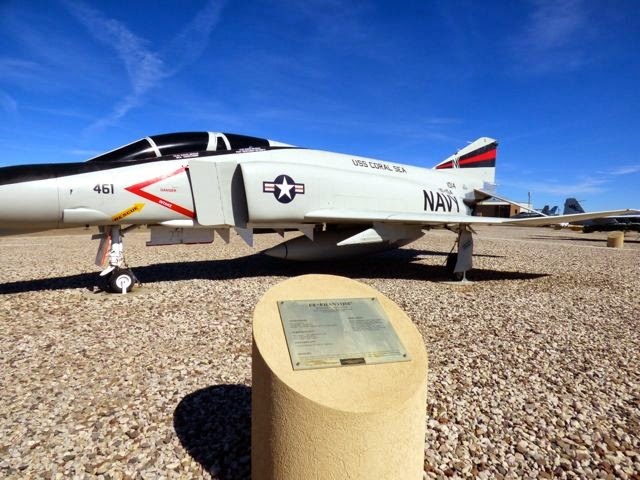 It is home to the Naval Fighter Weapons School (TOPGUN) as well as the Naval Strike and Air Warfare Center. Navy Seal training also takes place here. 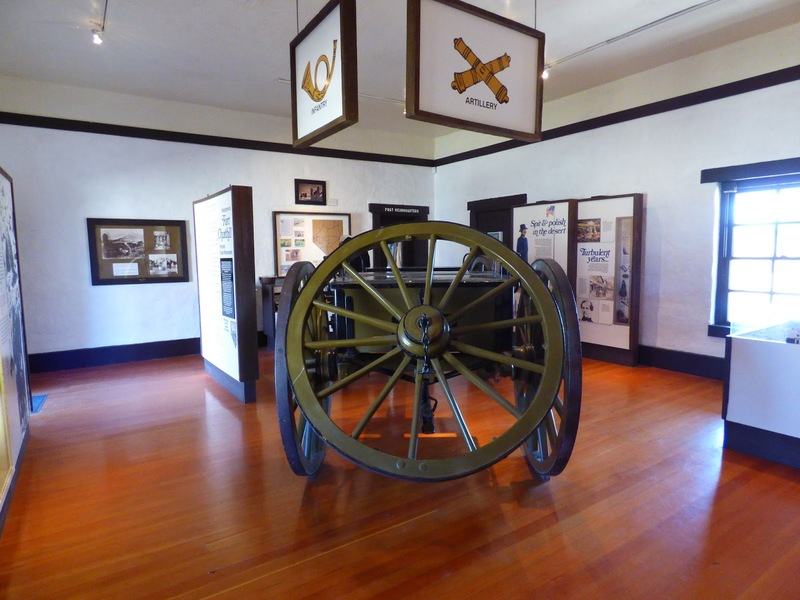 The purpose of staying here is to do some historic fort research and visiting in the area. 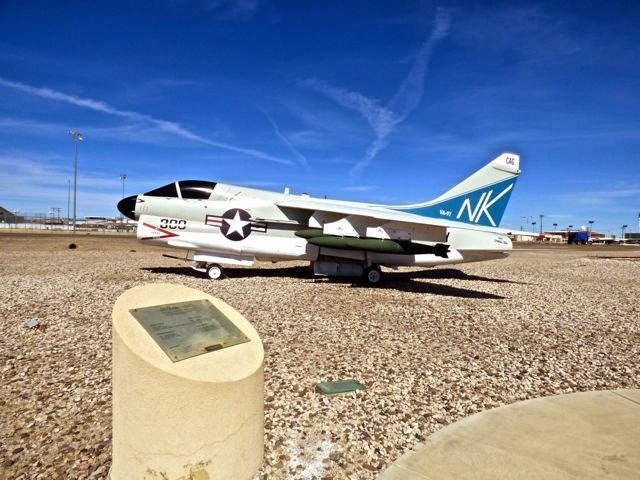 The base is around 50 miles east of Reno and 60 miles northeast of Carson City. 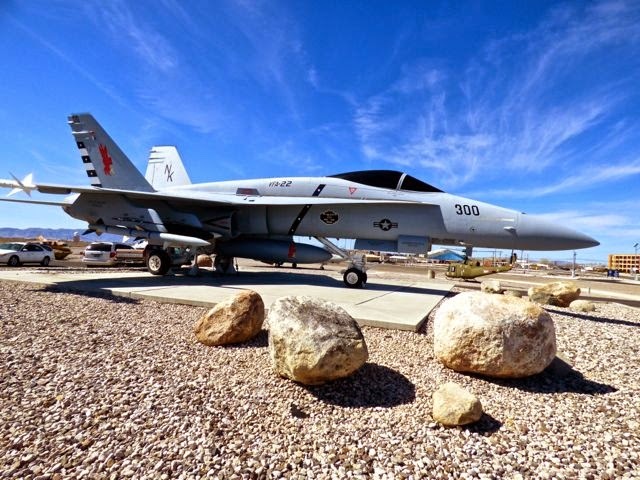 The RV park is small, but has has full hookups, a nice laundry,close to commissary and exchange and we are entertained by the fighter jets in training. 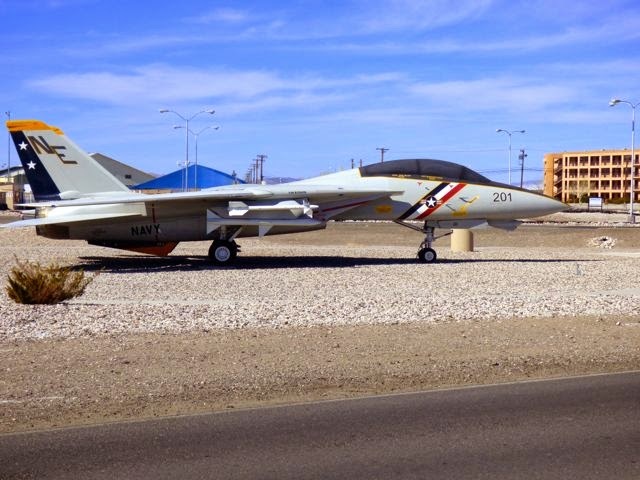 There is also a nice museum on base. 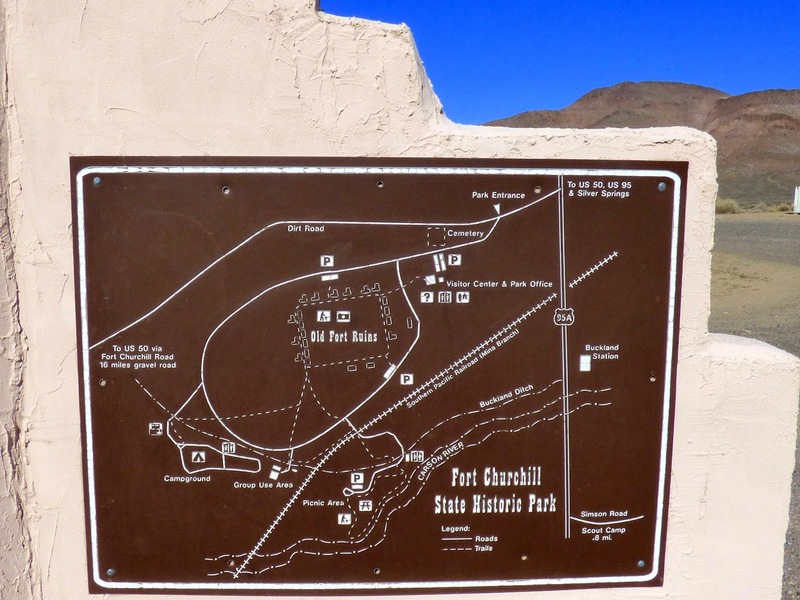 Tomorrow we plan to drive down to Carson City with a stop at Fort Churchill near Silver Springs off 95 alternate.